Subtitled: The Lost Lives of the Daughters of Nicholas and Alexandra. About a year ago, I heard of a children’s nonfiction called The Family Romanov. I was so excited! I thought I would finally be able to learn about the Romanov family without getting too bogged down in political and military stuff. It’s the people I’m interested in, and the series of events that happened to those people, not the state of the government. For me, the state of the government is the (very small) background on which a cultural study is laid. I’m more of a sociologist than a political scientist or military historian! Unfortunately, when I did finally start listening to the audiobook of The Family Romanov (nonfiction works so much better on audio for me! ), I didn’t get very far. The book began with a very strong bias, and I prefer much more moderate and unbiased nonfiction. I was so disappointed! Then, on the very same day that I gave up on that particular book, Kim from Sophisticated Dorkiness posted a picture on Instagram of The Romanov Sisters. I immediately looked up the book and discovered that the audio was read by Xe Sands, who I’d heard great things about. Sold! 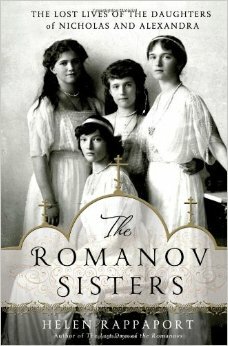 Happily, The Romanov Sisters was everything I’d hoped for. Rappaport puts together the lives of the Romanov family through letters, diary entries, articles, etc. It follows their daily lives, relationships, and problems. Of course it’s impossible to really get to know people who are long-dead, but it really did feel like I was getting to know the seven members of this family. Of all of them, I felt a particular kinship with Alexandra, mother to the five children, for a wide variety of reasons that I’m not going to go into here (way too long!). All of them, however, I felt some connection to. So often, the rich and the royal and the famous are set so far apart from everyone that it’s hard to see them as anything more than their image or persona. This book helped to make them all real people, with loves and faults and heartaches and naivety and faith and friendships. Most of all, their ties to each other and their love of family made them so much more real and relatable for me. Also, notably: This book made me eager to learn a lot more about Russian history. If that isn’t a recommendation, I don’t know what is! Performance: Xe Sands was a great narrator for this book. I was particularly happy with all of the Russian names and French excerpts, though I admit that I wish I had a physical copy beside me so that I could more easily look up spellings of places and such! This entry was posted in 2015, Adult, Prose and tagged audio, historical, nonfiction. Bookmark the permalink. I’m 100% with you on being more of a sociologist than a historian, and I think that might be the reason why we’re both bad at reading history! It just tends to feel so… contextless? I’m not sure that’s the right word, but I think that when I read it through the lens of the people who were actually living in the time, a lot of the broader historical details make a lot more sense than they do in list/purely expository formats. I’m glad that you finally found a book that scratched your Romanov sister itch. I know exactly what you mean, even if that’s not the right word. It really does help to learn things through the lens of the people! I definitely agree with your about the children’s nonfiction. I think most people who write adult nonfiction are trying to prove some kind of point and the people who write most children’s nonfiction are merely trying to educate. Sounds like a good book! I agree! Though the one children’s book I mentioned in here was definitely trying to sway children to think a certain way. No bueno. I’m with you on reading history. When it’s done well (you know, how I like it), it’s awesome; when it’s not done well, I truly hate it. The Romanovs have fascinated me since grade school, so I may have to pick this one up. Awesome! I hope it works as well for you. I’ve always loved Russian history. Not that I know that much about it, or tend to remember what I have read (or learned in college), but it’s still been one of my favorite historical subjects. Eons ago, when I was teaching, I used to reference a Lenin for Beginners book that was particularly awesome. It was like a graphic novel meets history text mash-up. That’s a very interesting mashup. 😀 Russian history is so frickin’ complicated, but I find myself wanting to really understand it better.